■ Medical pulmonary complications, surgical thoracic complications, and subclinical incidentally detected gas collections in the chest may occur after laparoscopic procedures. 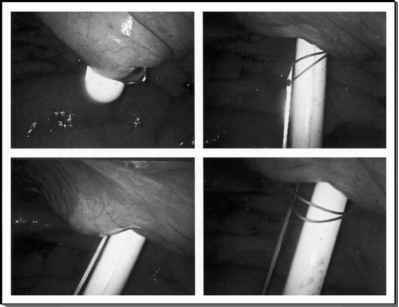 ■ Retroperitoneoscopy is associated with a higher incidence of abnormal gas collections. ■ The select clinically stable patient with pneumothorax, pneumopericardium, and pneumomediastinum occurring after laparoscopy can be treated with expectant management, including close monitoring and serial chest X-ray. ■ Clinically significant pneumothorax may require intraoperative or early postoperative intervention. ■ An intraoperative diaphragmatic or pleural injury in a patient who remains clinically stable can be managed with careful adjustment of ventilatory parameters. The proposed laparoscopic procedure can be completed and the diaphragmatic rent repaired. ■ Full relaxation of the abdominal muscles and avoidance of coughing and straining during laparoscopic procedures are additional precautions to prevent abnormal thoracic gas collections during transperitoneal and retroperitoneal laparoscopy.